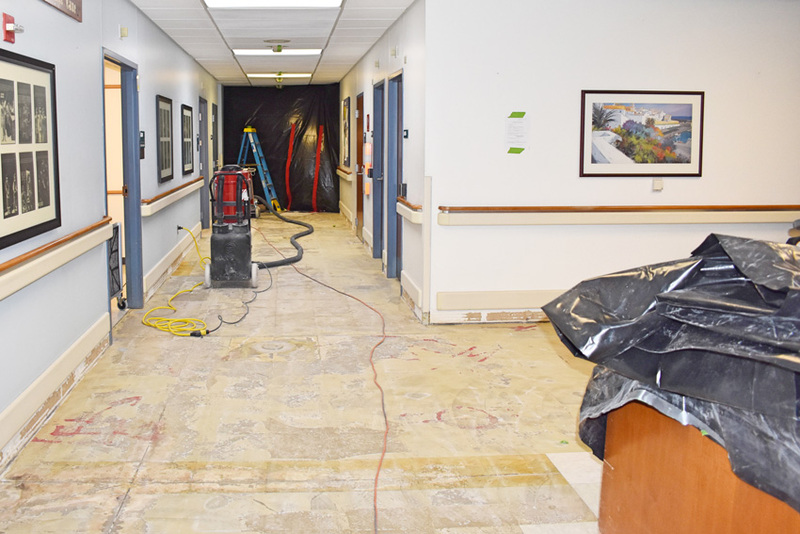 The VA was well aware of the problems that could occur when unqualified contractors installed floorcoverings. To reduce the amount of time and money spent fixing floorcovering installation mistakes, the decision was made to add an item to three sections of the VA’s Master Specification. Now contractors installing carpet, athletic carpet, or resilient tile flooring in VA buildings must have attained certain certifications in flooring installation. The VA Master Specification is a comprehensive set of more than 372 qualitative requirements that guide the selection of products, materials, and workmanship for VA construction projects. Architects, engineers, and construction professionals employed on VA projects are tasked with the responsibility of satisfying the tenets of the Master Specification. Changes were made to three sections of the Master Specification to require that flooring installers attain a specific type or level of installation training. The sections that now include these installation quality-assurance criteria are: Section 09 65 19: Resilient Tile Flooring, Section 09 68 00: Carpeting, and Section 09 68 21: Athletic Carpeting. The new language stipulates the qualifications for professionals installing resilient tile flooring, carpeting, and athletic carpeting in the following way. Installer qualifications: A company specializing in installation with minimum three years’ experience and employing experienced flooring installers who have retained and currently hold an INSTALL Certification or a certification from a comparable certification program. In short, according to the VA’s Master Specification, flooring installers selected to work on VA projects (installing either carpet, athletic carpet, or resilient flooring) must have attained, and currently hold, an INSTALL certification or a certification from a comparable certification program. The VA modified its Master Specification to require floorcovering installers working on carpet, athletic carpet, or resilient flooring projects to have attained and currently hold an INSTALL certification. INSTALL is an association of flooring professionals that includes major flooring manufacturers, contractors, and installers across the United States and Canada. The comprehensive INSTALL training and certification program was designed to instill the knowledge of floorcovering best practices, offer extensive hands-on training opportunities, and keep participants current on the various emerging trends, technologies, and materials of the flooring industry as they change over the course of a career. The four-year apprenticeship program consists of classroom training, practical training, and on-the-job training. The training curriculum provides core skills for proper floor preparation, installation, and finishing procedures for carpet, resilient flooring, resinous flooring, hardwood flooring, substrate prep, concrete polishing, artificial turf, and more. Apprentices will also learn important safety skills, tips, and procedures to improve productivity on the jobsite, and gain green building awareness and a foundational knowledge of how to work in accordance with green building standards. One important feature of the INSTALL training program is the inclusion of the flooring manufacturers. INSTALL believes that manufacturers have the best information and insight about their own products, and the INSTALL team works tirelessly to ensure that the manufacturer-approved information is incorporated into the training program and updated regularly to capture the latest in technique and technology. This dedication to conveying manufacturer-supplied quality and current content has helped the INSTALL training program become the most endorsed and recommended training program in the industry. INSTALL also develops standards for determining fundamental installer skills, skill competence, theoretical knowledge, and hands-on skill testing. These INSTALL standards are reviewed regularly by the U.S. Department of Labor and by the labor departments of Canadian provincial governments, ensuring the apprenticeship program remains approved by the Department of Labor. Upon the successful completion of the apprenticeship program, the flooring installer, now considered a journeyman, has the opportunity to earn various floorcovering certifications from INSTALL and become INSTALL certified. There are six different certifications available: carpet, resilient, substrate preparation, master resilient certification, wood floor installation, and wood floor sanding and finishing. Each floorcovering certification must be individually earned by demonstrating a mastery of specific skill sets. Each certification lasts four years. INSTALL training doesn’t end with the one-time award of a certificate. INSTALL-certified installers must complete an additional eight hours of INSTALL training every four years to maintain each certification. INSTALL Contractors are companies that have hired employee installers that have been INSTALL trained, tested, and certified. This unique INSTALL-equipped structure enables INSTALL-certified installation teams to be more engaged throughout the project, which offers the installers access to better information and enables them to more actively identify and communicate potential issues and resolve them before they compromise the success of the installation. There is an elite group of INSTALL Contractors that are backed by an industry-exclusive, free, third-party installation warranty. Referred to as INSTALL Warranty Contractors, these companies exclusively employ INSTALL-certified flooring installers as well as satisfy a variety of other criteria related to financial solvency, experience, and demonstrated success. The INSTALL Warranty on Labor is a free, extended, third-party warranty on installation that is beyond the manufacturer’s warranty. “Since beginning the INSTALL Warranty, we have underwritten more than $400 million worth of work and have never had to pay a single claim,” explains John McGrath, executive director of INSTALL. There are currently 11,000 INSTALL-trained installers in the United States and Canada. There are also 400 INSTALL Contractors employing INSTALL-certified installers and 45 INSTALL Warranty Contractors available to complete work backed by the INSTALL Warranty. As previously described, there are a number of common mistakes that can be made during a floorcovering installation. INSTALL-certified professionals have received the necessary training and know-how to avoid the typical pitfalls that can plague a floor prep, compromise a flash cove, weaken a seam, or destroy a pattern. Here is an example of how using an INSTALL contractor on a job enables the floorcovering installers to modify the usual process and provide successful outcomes, even when subpar conditions exist. During a project, installation of the floorcoverings is often scheduled to be one of the last major tasks that must be completed with installers typically scheduled to show up the day the installation is to begin. As such, installers can often find themselves with scant information on the conditions of the substrate before they arrive and without the wiggle room in the timeline to mitigate a moisture concern in the substrate. When working with an INSTALL contractor, there is more of a relationship between the flooring installers and the broader construction team, enabling the flooring professionals to gain access to the substrate earlier in the process to take multiple moisture and alkalinity measurements. This information gives installers a better idea of the status of the substrate as the installation deadline nears and enables them to communicate potential issues and proactively find solutions. Also, the contractor has better visibility around when the substrate will be ready and can delay scheduling the flooring professionals until conditions are optimal for installation. Since modifying the Master Specification in 2015 to require INSTALL-certified professionals be selected to install carpet, athletic carpet, and resilient flooring in VA facilities, the results have been positive. “I haven’t heard of any flooring failures on large projects since our relationship started, and while its tough to oversee and monitor small projects across hundreds of facilities, the benefit to our employees, patients, and bottom line has been immediate and profound,” Burdiak says. 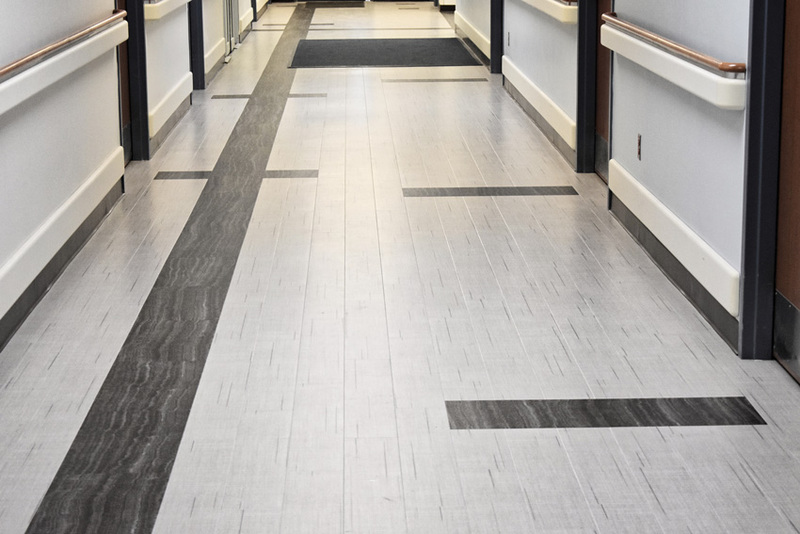 Since modifying the Master Specification in 2015, the VA has seen an immediate and significant improvement in the quality of its floorcovering installations, and the impact to the employees, patients, and bottom line has been profound. While the INSTALL training is required for any professional installing carpet, athletic carpet, or resilient flooring in a VA facility, the knowledge and training of INSTALL-certified floorcovering installers offers an incredible benefit to any health-care project. Avoid headaches, delays, and the costs to fix installation mistakes by incorporating training or quality assurance language into the flooring section of the project specification requiring that only appropriately trained professionals be hired to install the flooring. 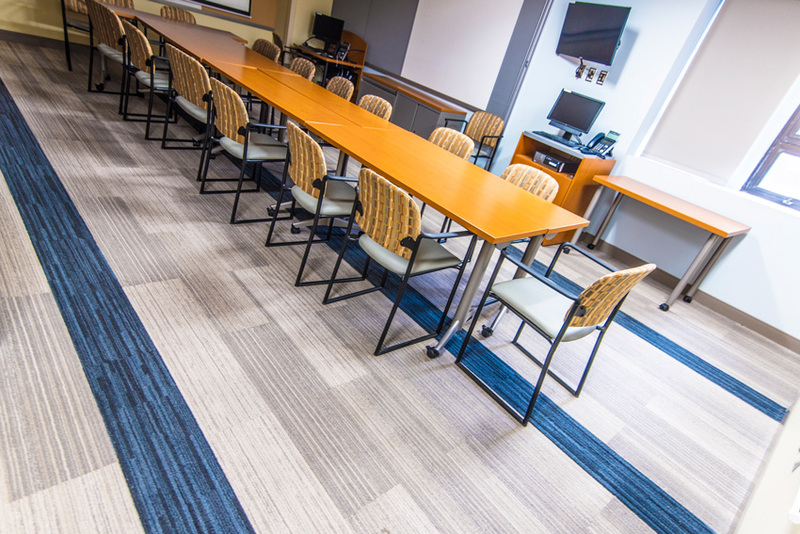 Looking beyond the nuanced world of flooring installation in health care and the impact that trained professionals can have creating safe and sterile environments, there have been recent developments in the training available to the broader health-care design and construction team. An important new program has been created to help designers, general contractors, interior systems carpenters, other building trades, and hospital staff address the very unique needs and dangers that construction work can pose in an occupied health-care environment. When an occupied health-care facility begins an upgrade, expansion, or renovation project, construction activities can introduce dirt, debris, and contaminants such as mold, asbestos, lead, and bacteria into an environment where immune-compromised people come to heal. Exposure to these elements can put patients at risk for acquiring other diseases and infections that could cause greater harm and further jeopardize their recovery and well-being. Containment of these potentially infectious and harmful agents is a critical aspect of keeping patients, staff, and the construction team safe and healthy during construction in the occupied health-care space. Construction activities can introduce dirt, debris, and contaminants into the health-care environment that could be dangerous for immune-compromised patients trying to recover. While many large urban hospitals and health-care systems have experienced infection-control departments and detailed infection-control plans, successful infection control relies on the construction team’s ability to properly implement and execute the plan. Smaller or more rural health-care facilities may not have the same infection-control resources and depend more on the experience and know-how of the construction team working on the project.